Whooping Cranes: Biology and Conservation covers one of the most endangered birds in North America, and the subject of intense research and highly visible conservation activity. 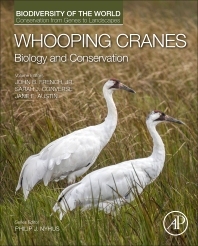 The volume summarizes current biological information on Whooping Cranes and provides the basis for future research necessary for conservation of this species. This edited volume concentrates on work completed in the past 20 years in the areas of population biology, behavior and social structure, habitat use, disease and health, captive breeding, and Whooping Crane conservation. Much of the information presented comes from the study and management of remnant and reintroduced populations of Whooping Cranes in the field; some information is from experimentation and breeding of captive Whooping Cranes. Whooping Cranes: Biology and Conservation seeks to inform and galvanize action dedicated to meeting the challenges faced by Whooping Crane managers and conservationists. Thus, it describes one model of endangered species conservation and restoration that will interest a wide audience: professionals that work on cranes; researchers in the fields of small population biology, endangered species, and avian ecology; wildlife veterinarians and those involved in avian husbandry; administrators of management agencies or conservation organizations; conservationists in other fields; teachers of conservation biology or ornithology and their students; and the educated general public. Philip Nyhus is Director of the Environmental Studies Program at Colby College in Maine, USA. His interdisciplinary research bridges the natural and social sciences to address human interactions with the environment, including endangered species conservation and recovery, human-wildlife conflict, large landscape conservation, and spatial modelling. He is co-editor of Tigers of the World: The Science, Politics and Conservation of Panthera tigris (2010). John is the Center Director of the Patuxent Wildlife Research Center, and oversees research on a wide variety of topics including Wildlife Toxicology, Coastal Ecology, Population modeling and Decision Science, and a variety of monitoring programs including the N. American Bird Banding Lab and the Breeding Bird Survey. Patuxent also has responsibility for the North American vertebrate collections at the National Museum of Natural History, Smithsonian Institution. John sits on the US-Canada Whooping Crane Recovery Team, and has been involved in whooping crane conservation for many years. John’s scientific training was in vertebrate ecology and physiology at the University of Wisconsin, and was hired initially at Patuxent to undertake research on wildlife toxicology. Sarah J. Converse is a Research Ecologist with the U.S. Geological Survey, the Unit Leader of the Washington Cooperative Fish and Wildlife Research Unit, and an Associate Professor in the School of Environmental and Forest Sciences (SEFS) & the School of Aquatic and Fishery Sciences (SAFS) at the University of Washington, Seattle. Prior to taking this position in early 2017, Sarah spent 10 years as a Research Ecologist at the U.S. Geological Survey Patuxent Wildlife Research Center, where among other research projects, she was deeply involved in research on the population ecology and conservation of reintroduced Whooping Cranes. Sarah’s research program is built around two themes – quantitative population ecology of endangered species and decision analysis applications in endangered species management. Dr. Jane Austin is a Research Wildlife Biologist with the U.S. Geological Survey’s Northern Prairie Wildlife Research Center. Her research and writing have focused on the ecology and management of cranes, waterfowl, and other waterbirds in the northern U.S. Her interest in cranes developed during a study of the crane breeding ecology and population management of greater Sandhill Cranes in southeast Idaho. She became actively involved in the North American Crane Working Group, which led to work with the International Crane Foundation on international crane conservation issue. Jane served on the external review team for the Whooping Crane Eastern Partnership and has been involved with other projects focusing on ecology, habitat use, and management of North America’s cranes.